Sometimes I have really great ideas! Last year’s lightbulb moment involved a little patience and a lot of luck to land the perfect pot on sale and hard-to-find sparkler sedge (Carex phyllocephala ‘Sparkler’). In less than a year, it’s handled rain bombs, flash drought, and below freezing temps. Containers are a fun way to accent garden and patio, grab attention, and grow plants that would hate you if you put them in the ground. Marcus Young from Bloomers Garden Center joins Tom to style up containers that transition between seasons with flowers and edibles. Select evergreens, like dianthus, succulents, and even mondo grass as your base. Then, swap out annuals every season. Or go simply succulent with a dynamic array of colors and foliage. Made of fabric, Smart Pots come in many sizes for portability and easy storage. And get a good potting soil! This is where your plants live 24/7. One of the first things a garden mentor taught me: Pick up the bag. If it’s clunky heavy, it’s a waste of time and money. Watch now. You could grow butterfly iris (Dietes) in a container, but make it a big one! Its upright structure magnifies its playmates and works equally well in sun and part shade. It’s adaptable to rain bombs and drought, and popular for its soft foliage that punctuates like yuccas or agaves, but doesn’t puncture you. Although root hardy to 10°, in extended freezes it can die back. If so, shear off dead leaves to reinvigorate. If some leaves just brown up, I simply cut them off with garden scissors. Most commonly you’ll find D. bicolor, blooming light yellow with purplish brown centers in spring. When I can find them, I like to get Dietes iridiodes for its larger flowers of white, yellow, and lavender. Find out more about Daphne’s Plant of the Week. Last fall, several viewers had the same problem with their citrus trees. Marie and Art Crowe found tunnels on new leaves. On Sanjay Sundaram’s otherwise healthy trees, the leaves are shriveled. Texas A&M AgriLife Extension fruit specialist Monte Nesbitt confirmed Daphne’s analysis as leaf miners. “In areas with warm winters, they’re seen every year, and cause damage by feeding on soft, tender new leaves, thus interfering with normal growth, pinching leaves in spots and causing them to be deformed and shriveled-looking,” Monte wrote us. But they don’t affect the plant’s overall health,so there’s no need for pesticides. Find out more about leaf miners. Despite our destructive cold spells, warmth and rain guarantee an army of insect pests. John compares pesticides and explains how to make your own pepper/garlic spray. Check out Rodale’s The Organic Gardener’s Handbook of Natural Pest and Disease Control for bee-wise control. 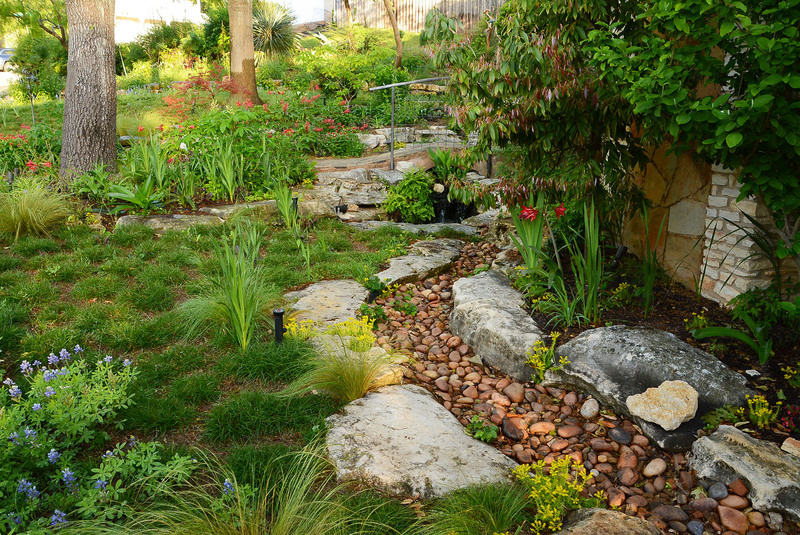 On tour in San Marcos, Lydia Kendrick weaves together a garden of many levels. She can see it all on a deck made by her husband Larry, former Chief of Police, who drowned in 1997 in San Marcos River’s flooding waters. Since then, she’s carried on the work they’d begun. First was to re-grade the sloping backyard to control flooding rainwater while creating garden destinations. To water her colorful container plants and the garden, she collects rainwater from every gutter. Then, she took a weaving class and got hooked! Now, at Kendrickkreations, she markets beautifully crafted fine yarn items. With scrap yarn, she took her art outside. A confirmed recycler, when friends offered her colorful newspaper sleeves, she turned them into outdoor garden art. Don’t they look like real yarn? At thrift stores, bulky trash days, or other innovative hunting, she salvages finds for weaving frames or to color up garden entrances. Prayer flags buoyantly uplift the view. “The idea behind them is they carry the wishes and the good prayers with them as they fall apart and birds carry off little pieces of them. It’s a peace flag I guess, if you will,” she tells us. Lydia hangs colorful sail shades to soften hot Texas days. When temps climb to 90, she hits the ladder to keep friends comfy at frequent parties. Sometimes, everyone brings a ribbon, string, or fabric scrap to collectively weave their lives together on one of Lydia’s recycled frames. She weaves the upper deck patio into her colorful scheme. And Lydia’s birds build the most colorful nests around! A champion of rescued dogs, she’s always got a couple of gregarious pals around. For those she’s lost, she honored them by painting a dog paw on a big old rock. What a great idea! Watch Lydia’s story right now! ← Front Yard Food Forest & Pruning Prep!